A top official from the Xinjiang Uygur autonomous region confirmed for the first time on Tuesday that Xinjiang residents have joined the radical group Islamic State. "Some Xinjiang residents have crossed the border illegally to join IS. The group currently has a growing international influence, and Xinjiang is affected by it, too," said Zhang Chunxian, the region's top leader. "We recently broke up a terrorist cell run by those who returned from fighting with the group," Zhang said at a news conference on the sidelines of the annual National People's Congress session. He said IS, which has seized large areas of eastern Syria and northern and western Iraq, is a threat to countries worldwide and joint international efforts are needed to fight it. Xinjiang has been hit by religious extremism, leading to an increasing number of terrorist attacks in the region and elsewhere in China in recent years. Last year, Chinese authorities arrested some of those attempting to cross borders illegally to join terrorist or extremist groups. In southern Xinjiang's Hotan prefecture, some people have been influenced by IS, but measures taken to eliminate religious extremism can handle the new situation, according to Eziz Musar, the prefecture's commissioner. Zhang said Xinjiang has been working hard to end religious extremism while dealing with inroads made by new groups, but this takes time. "Xinjiang also has to pay the price when extremists fight back. The region has done a lot to ensure social stability in China," he said. Adudulrekep Tumniaz, president of the Xinjiang Islamic Institute, said the region has more than 12 million Muslims, making up 52 percent of China's Muslim population. Guiding them in the right direction and keeping them away from religious extremism is a matter of national security. 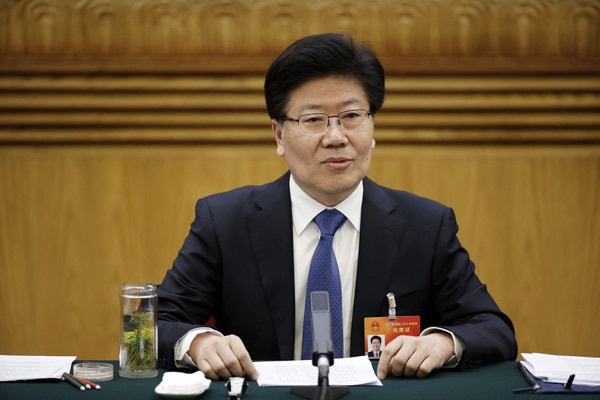 Shohrat Zakir, the newly elected chairman of Xinjiang, said there have been terrorist activities in the region due to the international situation. But there will be fewer violent terrorist attacks because authorities have been striking hard against terrorist and extremist activities in accordance with the law, he said. "The overall situation in Xinjiang is stable and controllable," he said. He also spoke of the importance of Mandarin education in rural areas of southern Xinjiang, which have seen the most terrorist attacks in the region. "Many villagers in southern Xinjiang still cannot speak the national common language, which has affected their employment chances. They are also more easily manipulated if they live in closed communities," he said.